Feu Sacre III' both available from the excellent Too Fat Lardies. Landwehr, though we are seldom successful. better. The table set up is below. challenging when you realise that Girard is actually rated a 'Poor' commander! 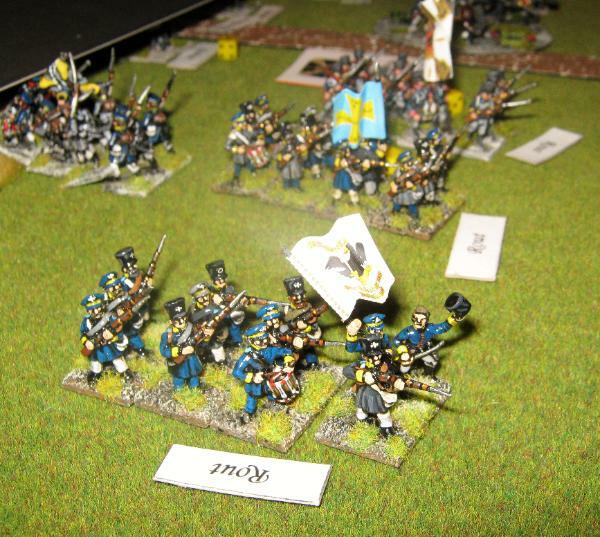 That said, the victory conditions are very difficult for the Prussians to win. they suffer. 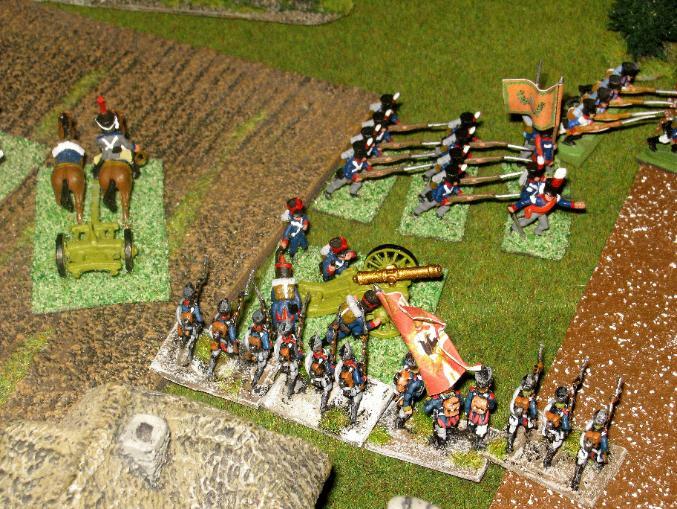 This becomes a major victory if the French suffer three times the Prussian losses. victory if they simply hold Hagelburg. 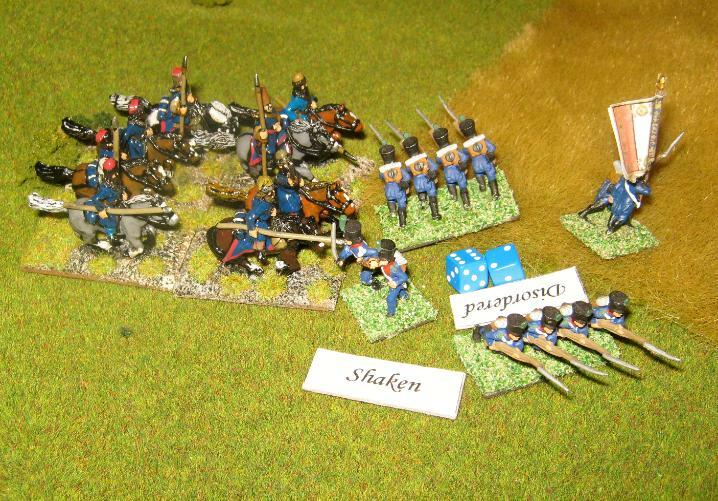 Clive deployed his main force of a dozen Battalions and two batteries in and around Hagelberg, deploying in depth on the road to Klien Glien. 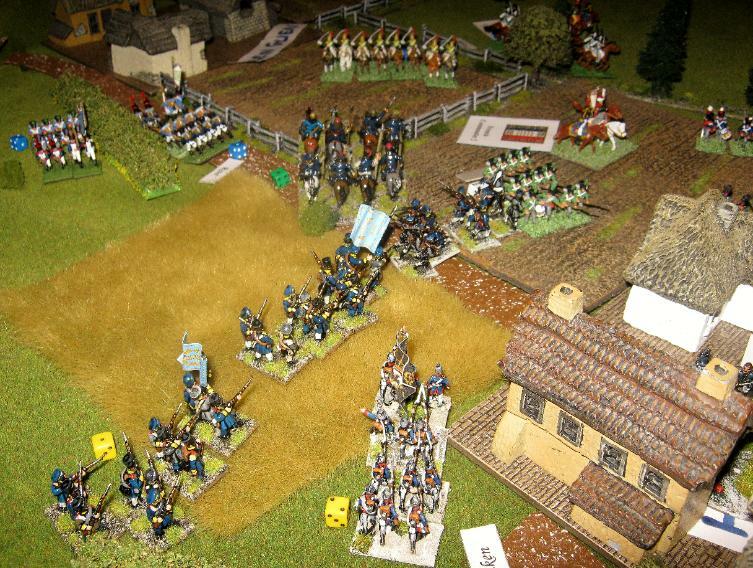 His left consisted of a dummy blind and a brigade of French cavalry, covering the open ground. Initially our blinds were off table but the Prussians were allowed to enter via the Thiergarten, or on either the Belzig road or road to Lubnitz. ten gun battery of medium guns entered on the Belzig road. Clive was essentially to be attacked from three directions. 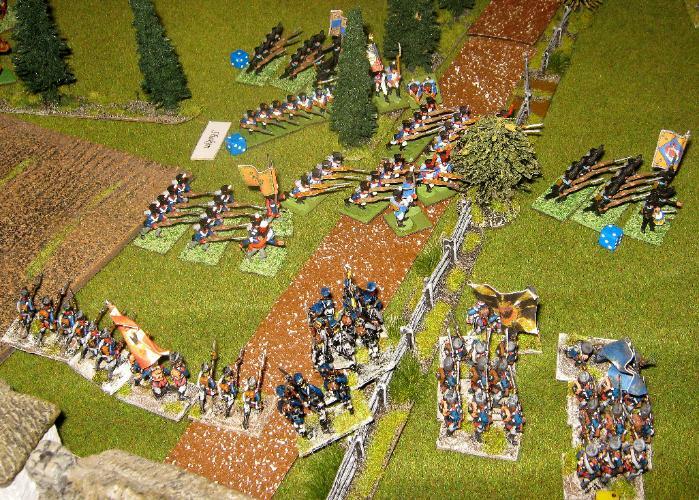 Max's main infantry force is spotted marching onto the table via the Thiergarten woods. Max deployed in depth two 'Brigades' up and two in support. 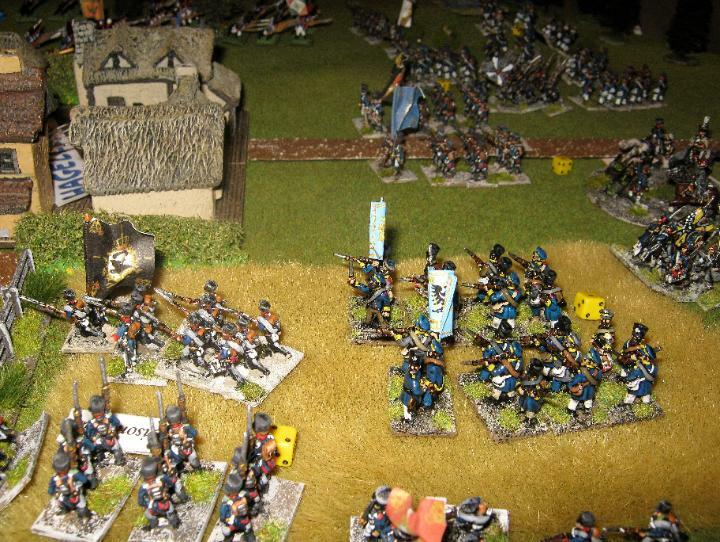 My cossacks, and Nigel's detached infantry brigade's, blinds make an appearance. with the cavalry blind in support. 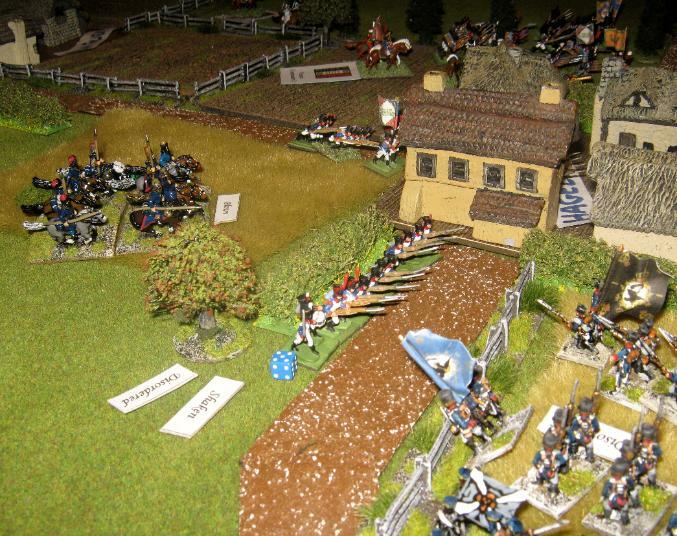 As his blind is spotted his force begins to deploy in detail. 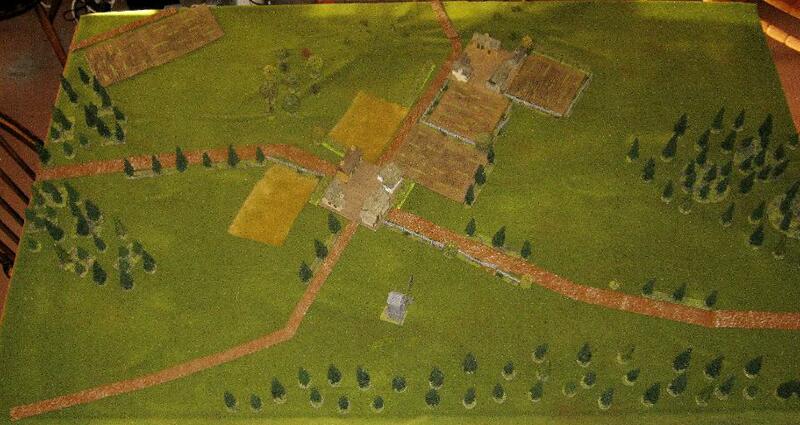 Hagelburg is occupied by a battalion with a column in support on the left, flanked by artillery and a square. The small wood, of which a tree is visible bottom left was occupied by another battalion. 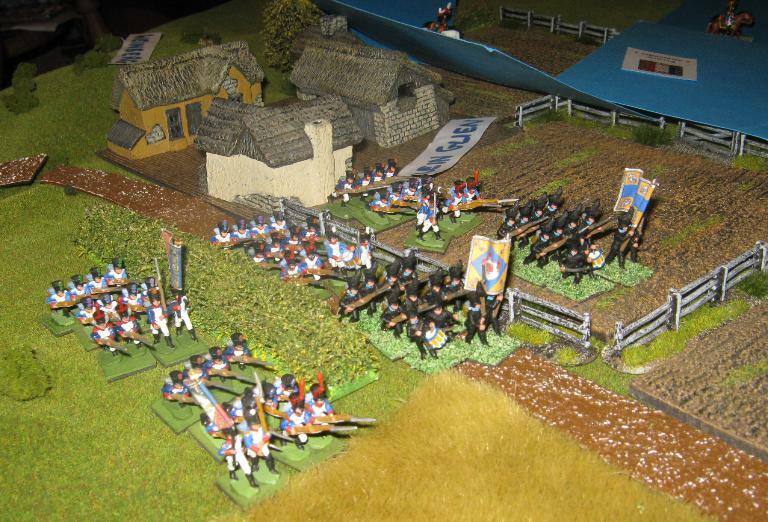 The remaining battery and two battalions were deployed on the other side of the town. In support , just north of Klien Glien were the remaining six battalions in columns of waiting. 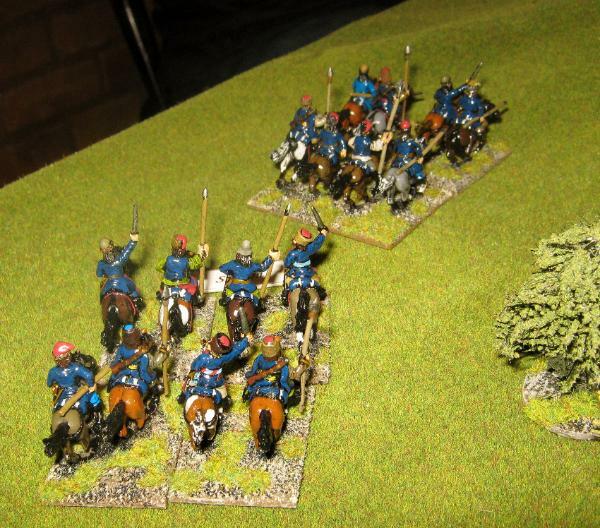 the small wood with Cossacks. 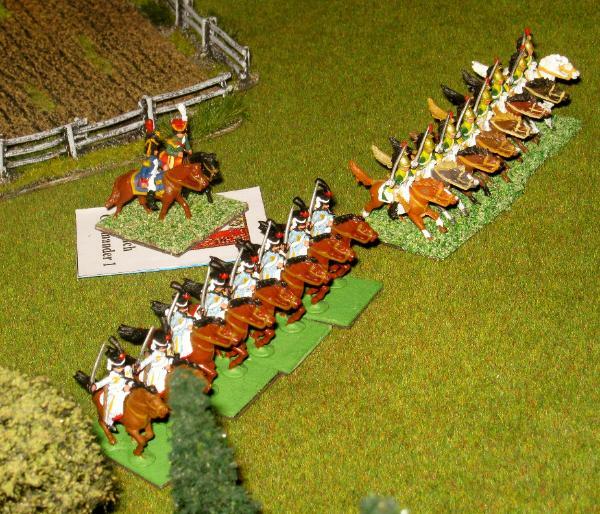 Paul's detached Landwehr cavalry brigade are spotted exiting the Thiergarten woods. 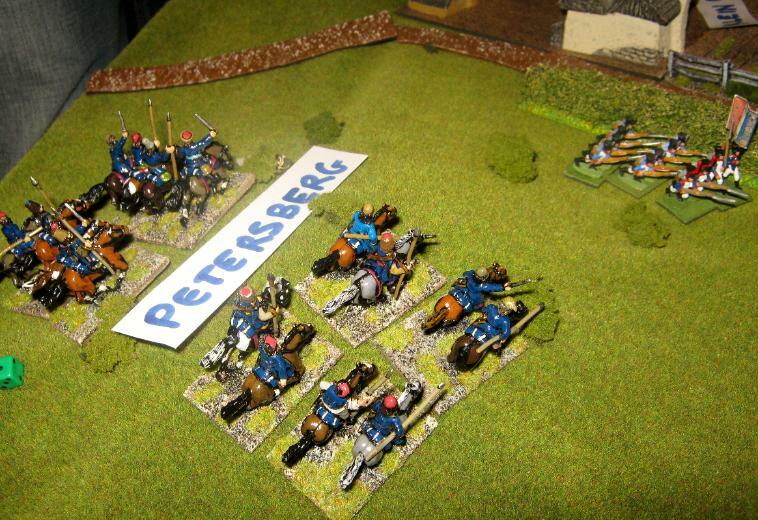 Clive's detached cavalry brigade is spotted on the French left. Max begins to flank Hagelburg after an initial assault on the town is repelled and attacks the French battalion in column. 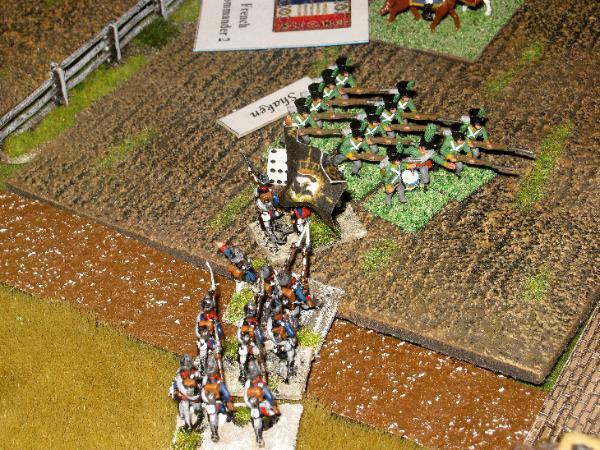 The leading Landwehr unit is routed and sweeps away its support in rout too. Nearby shaken units also rout. Back to the drawing board? 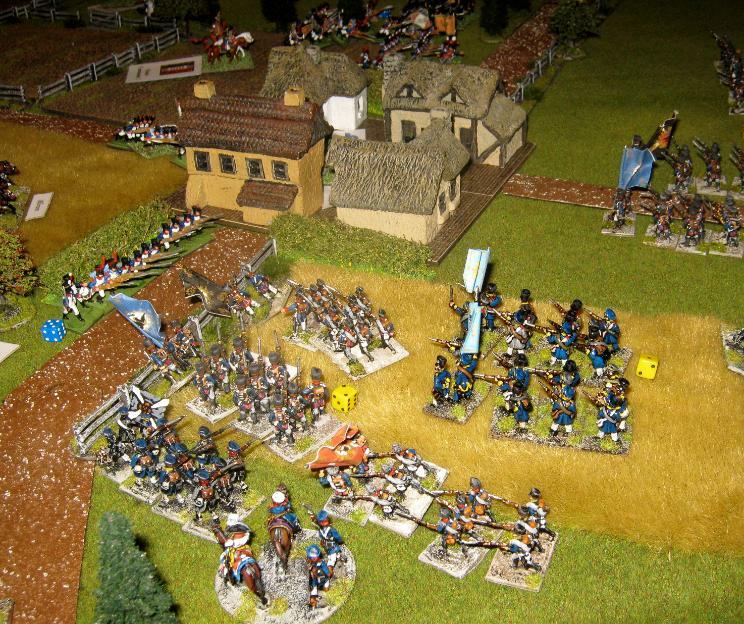 The cossacks pounce on a square shaken by artillery fire routing it. ...with cossacks threateningly menacing the rear. 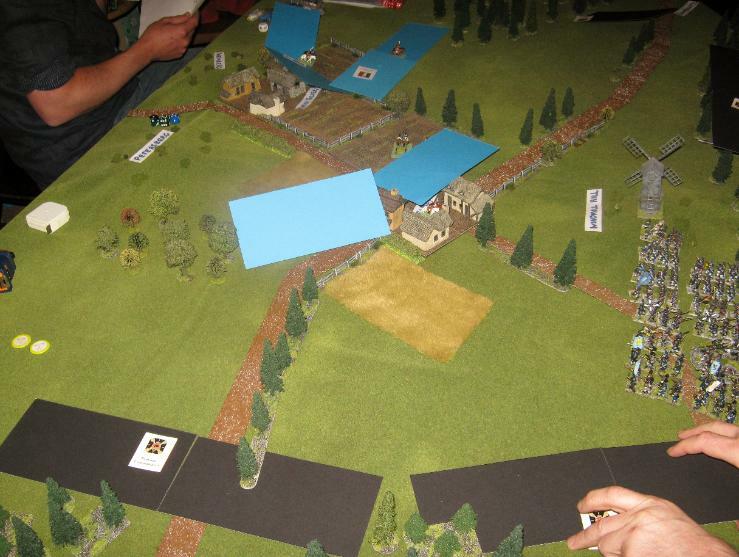 Clive defends the approach with a battalion in line but is shaken by artillery and is taking heavy casualties. 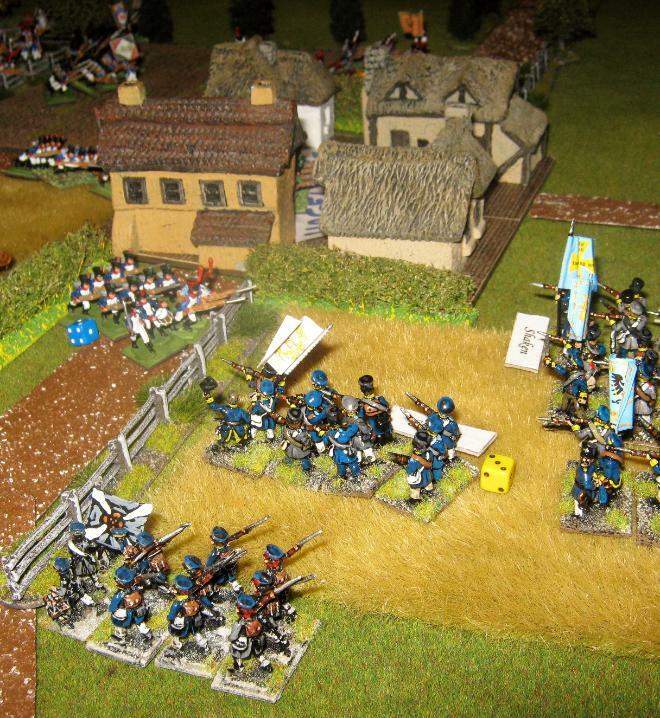 Nige breaks the enemy and assaults Hagelburg from the right flank. ....and a column fails to turn to face. 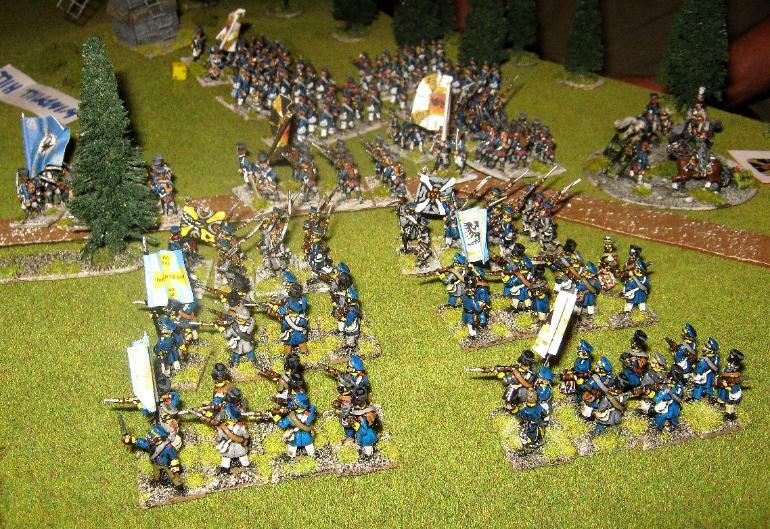 ...and the French infantry are encircled! Nige's force to deliver the coup de grace. time the attackers bounced back with very little loss. 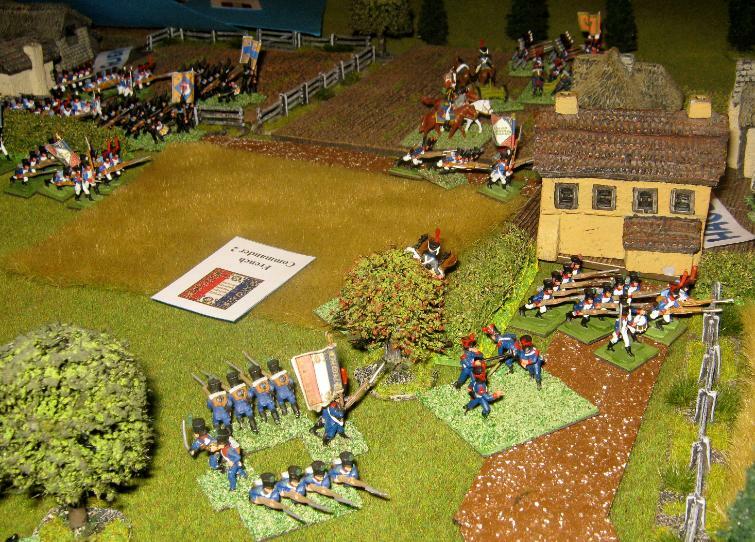 The French put up one hell of a fight and we all accepted that had they had even just a 'solid' commander things would have been very different. 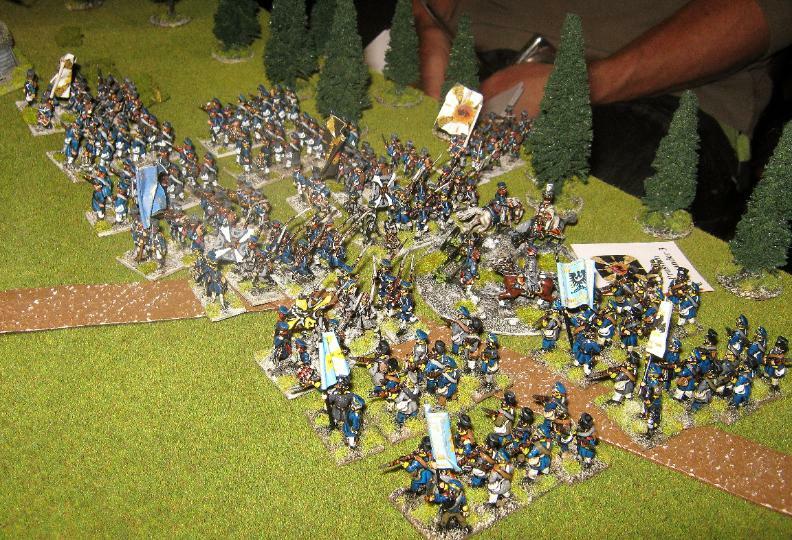 time he was able to sort out his command he had been hit in the flank. into Hagelsburg but it is to be expected when we haven't played the rules in a while. It is an extremely challenging scenario but really good fun and I urge you to dust off those Prussians and French and give it a go. 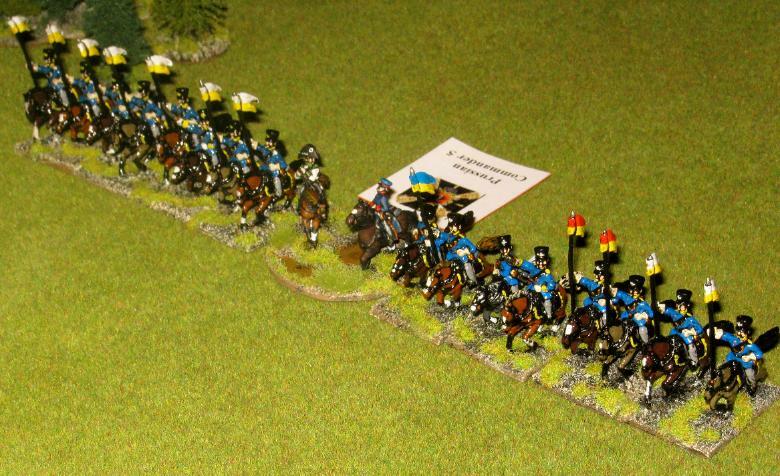 and Landwehr cavalry - Essex Miniatures by yours truly, who also took the photos. French - Minifigs owned and painted by Clive. 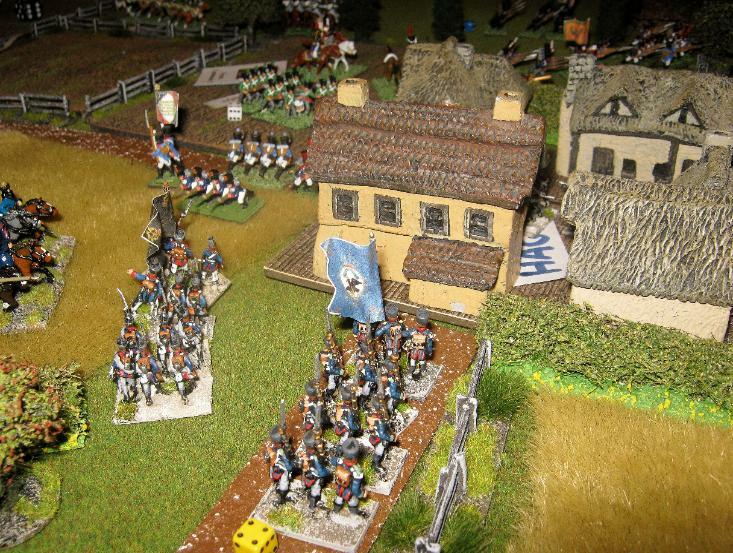 Buildings - JR Miniatures available from Magister Militum.